“Sensei ni rei!” Everyone bowed with sensei. “Otagani rei!” Everyone bowed again. “Kiritsu!” We all stood up. “Sonoba zuki!” We prepared to deliver a basic punch from a natural standing position. Sensei looked thoughtful for a moment and then said “Yamee”.. we all stood down. “I’ve been ‘hammered’ a few times” said one young lady. “That’s enough of that now” said sensei well aware that he would get that response and added interest. “The other motion of the wrist ‘on contact’ as you’re screwing them!” Sensei knew that would get a laugh. “One volunteer please!” One unfortunate suspect got pushed forward to sensei by his mates behind him; he staggered forwards with a surprised look on his face. Sensei obligingly placed his fist on the uke’s chest and demonstrated the power of the screw and hammer motion, sending him flying across the room. “Well observed young Grasshopper. Indeed I did ‘vibrate’ more than ‘wiggle’, but the movement of the hips is a result of the pulsing in the feet which is timed with the screw and hammer motions in the wrist.” Sensei waited for that information to sink in. “First of all with good old sonoba zuki – let’s break the movement down into parts. 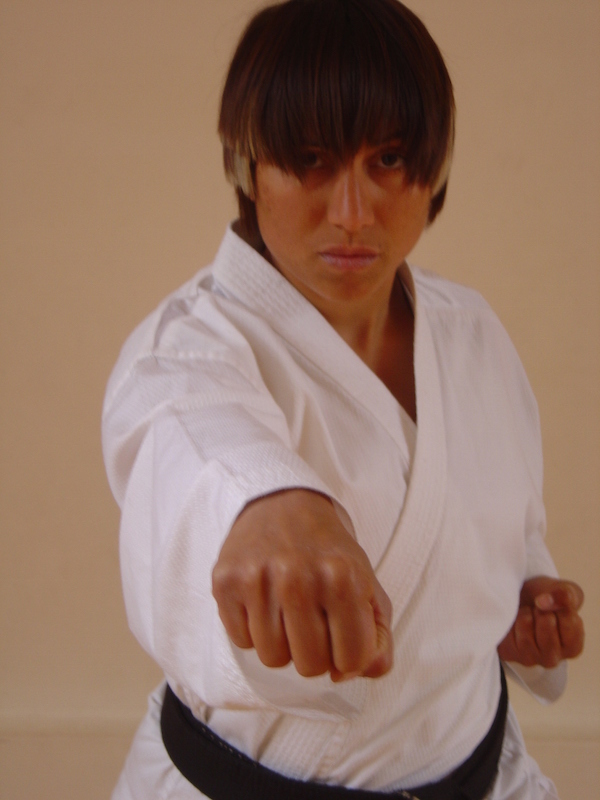 On ich you punch to a vertical fist, with the arm one fist width from the body and the hikite withdran to the elbow. On ni you vibrate the hips utilising the hammer and screw motion of the wrist for kime and penetration. The class practised with correction for about 15minutes. “Okay, now do as I demonstrated earlier and place your fist on your partners chest and use only the hammer and screw motion fired by the hips.” Suddenly bodies were flying around everywhere with a lot of oohs and ahs…. and a few calling out to Jesus..
Moving up and down with these techniques allowed us to hone these skills. Many people just ‘plod’ up and down with basics, but sensei used them as ‘floor exercises’ allowing us to perform in our own time so that we could focus on improving the fluidity and timing of our new found knowledge. “Finally, let’s do it on the pads. Don’t try to hit them as hard as you can, utilise the skills learned today and take your time so that you can absorb them.” We found that our punches now had more ‘bite’ the impact skills meant that we got the penetration we needed. Next Next post: MMA Or Karate?